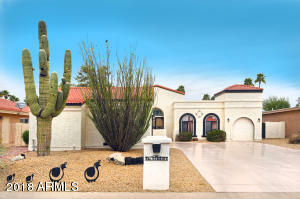 STUNNING remodel-top to bottom in Custom Pima w/2280 square feet! Two bedrooms, 2.5 baths plus office & lots of open space. 2-car garage w/new door, opener, storage cabs, workbench AND golf cart garage w/new opener & overhead storage w/dropdown ladder. Soaring ceilings create large open floor plan w/all new porcelain wood-look tile thru out. New doors & window coverings on double glazed windows. Granite kitchen counters w/custom cabinets & hardware. Wet bar w/instant hot water. 80 gallon solar water heater, Roof replaced with 3” foam & elastomeric paint. 2 NEW Trane heat pumps-12 seer-multi zone. New toilets, sinks, granite bathroom counters, light fixtures, blinds, crown moulding…nothing spared in this beautiful remodel. Expanded Master w/patio access. Guest BR ensuite. Move-in ready!